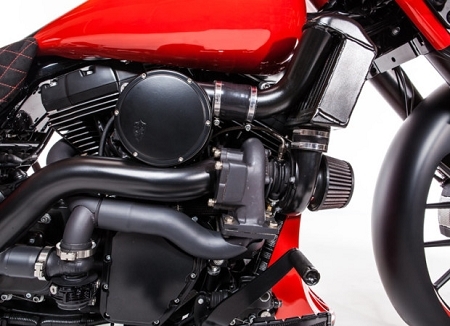 Designed for the 120R motor from Harley Davidson. When it comes to reliability and performance look no further. With the GT25 turbo and 9lbs of boost it makes this motor come alive! With 166HP of power at the twist of the throttle you better hang on for a thrill ride! With the turbo system it’s a cruiser, traveler and hot rod all in one package. No need to do any engine modifications. This system makes peak horsepower and torque right where you need it, between 3,000 and 4,000 RPM’s. The system includes: Stainless steel head pipe w/heat shields, steel tail pipe w/heat shield, muffler assembly w/ billet tip (right side only – dual kits available option), modified Garrett GT Series turbo w/8lb actuator, patent pending billet plenum w/ snap in velocity stack for in interrupted air flow, billet breathers, Trask intercooler w/billet top cap, billet boost gauge kit, a complete hardware kit (which includes a performance Barrnett clutch spring, high flow injectors and NGK spark plugs), step by step instruction packet. 6550 points will be rewarded to you when you buy this item.